Few people can actually testify to taking regular cold showers. The number is likely to be much less for those from a colder climate. Nonetheless, cold baths and showers have an extended history in numerous cultures and for good reasons. For instance, in the 1930s, cold water was utilized to cure a number of ailments. This treatment achieved almost instant success. However, as the twentieth century moved along, the treatment’s popularity started to falter and decline. This was especially true after medical professionals began to depend more on drugs to take care of illnesses. Consequently, the luxury of hot showers increased over time. Before getting into the real benefits of taking a cold shower, it is important to establish the vital fact that hot showers are not a necessity but a luxury. Throughout much of human history, people had to take a bathe in any water that was available. The Greeks invented heating systems to be utilized by the public during the 1st century BC. Nonetheless, interestingly enough, most Greeks opted to continue using cold water because of its countless health benefits. Cold water does more than just washing away viruses, bacteria, old skin cells, dirt, and sweat. Cold showers, if taken regularly, can provide numerous outstanding benefits for great health. Brown fat is good. It helps generate heat and keep you warm whenever it is cold outside. When you are overweight, or carry excessive weight around your thighs, neck, lower back, or waist, it means that you have too much white fat. White fat is unhealthy and very hard to shift. Scandinavian researchers discovered that exposure to cold temperatures helps substantially escalate the metabolic rate of brown fat (Dr. Squatch Blog). The study discovered that this rate increases by roughly fifteen times which translates to potentially helping you lose approximately nine pounds annually if well sustained. Perhaps this explains why Scandinavians boast the lowest obesity rates throughout Europe. Taking a cold shower brings with it numerous mental benefits. Many years ago, every morning, ancient samurai warriors poured buckets of cold river water onto their heads in a Shinto practice known as Misogi. This was simply a purification ritual on some spiritual level. The warriors believed that it cleansed their spirit and came in handy in starting a new day as well as new adventure fresh. Cold water is great at helping one totally wake up which is exactly what many people want in the morning. Additionally, it invigorates and energizes your entire being with the quintessence of life. Whenever you feel unmotivated or down in the morning, just take a cold shower and discover the magic. Cold water is incredible at making your hair look shinier and healthier. Cold water closes hair cuticle, which makes your hair stronger and prevents dirt from effortlessly accumulating in your scalp. Stronger hair prevents hair from easily being pulled out whenever you are combing. It also plays a huge role in slowing down general hair loss. Cold showers also help relieve depression symptoms. Because of the high concentration of cold receptors on the skin, a cold shower usually sends an overwhelming amount of electrical impulses from the peripheral nerve endings straight to the brain. This can result to an anti-depressive effect. Consequently, if you need an incredible ‘pick-me-up’, just jump in the shower and be sure to turn it to blast setting. Cold showers cause one to breathe deeply. Deep inhaling comes in order to try to counter the vasoconstriction, shock, and general need for oxygen to respire as well as keep oneself warm. This process usually opens up the lungs – similar to what strenuous physical exercise does – resulting to a higher average oxygen intake, which is excellent for countless things like not being tired during the day. Taking a cold shower has the ability to raising hormone production and activity by boosting the body’s glands. For instance, cold showers are a great benefit to the reproductive system especially when trying to conceive a child. The testes of a man aren’t supposed to get too hot. In fact, that explains why they usually hang outside a man’s body. Anytime the temperature of the testes increase, sperm counts decrease. Actually, experiments that were done during the 1940s revealed that hot baths acted as an effective contraceptive. Men that took thirty-minute hot bath every day for three weeks were infertile for the following six months. Most recently, the University of California conducted a study with men that were exposed to thirty minutes of ‘wet heat’ (saunas, hot baths etc) for a week. When the exposure was cut out, their sperm count escalated by 491%. Their sperm’s motility improved too. Even though switching from hot to cold showers might not have a dramatic effect, if you are trying to reproduce, it will surely not hurt. Additionally, cold-water therapy assists regulate the endocrine system (including the thyroid and adrenals). The lymphatic system is responsible for carrying away any waster from the body cells. This system also helps fight diseases (pathogens). Unlike blood vessels, this system doesn’t have any blood. It has lymph that carries white blood cells and waste products. The lymph depends on muscle contraction. This contraction squeezes it right to the thoracic duct so that it can mix with blood and afterwards be dealt with by organs. By taking a cold shower, you enable whole-body contraction. This works perfectly with the lymph system by squeezing the fluid through the body. Anytime the system is inefficient and compromised in any way, the fluid usually pools at faraway places – normally the feet. This results to a type of edema known as lymphedema. Cold water offers a gentle form of stress that usually leads to thermogenesis (the internal generation of body heat). This in turn goes miles in activating the adaptive repair system of the body. If you suffer from unceasingly cold feet and hands, or normally feel that you experience abnormal sweating, try a cold shower. You will love the results. Excellent blood circulation is essential for general cardiovascular health. 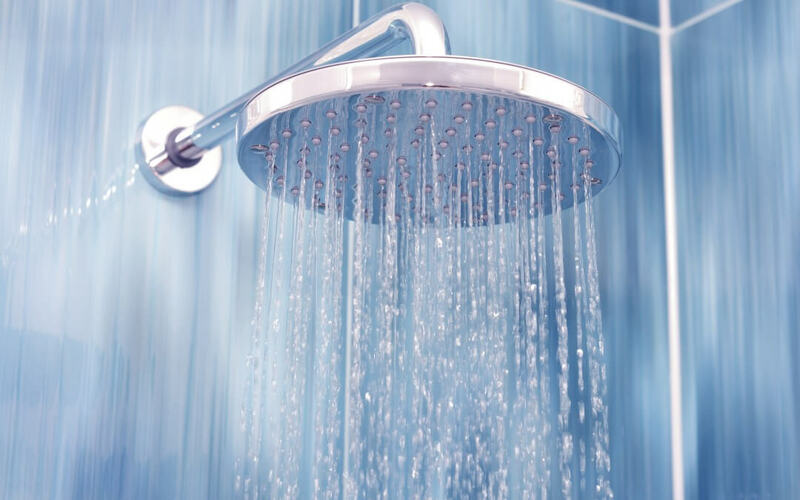 A great way to enhance circulation is alternating between cold and hot water while showering. Anytime you are exposed to cold water, body veins and arteries tighten or constrict. This process is referred to as ‘vasoconstriction’. The tightening ensures blood flows at optimum pressure levels. ‘Vasodilation’, which is the opposite effect, comes about when one is exposed to heat. Excellent blood circulation comes in handy in improving the overall performance of your system thus helps you to not only look but also feel better. Insomniacs are time and again advised to shower with cold water. This might be due to the fact that the body relaxes and calms down after the initial shock of a cold shower. This drastically improves your sleep. A great benefit of taking a cold shower is that you subject your body to some stress levels within a controlled environment. This teaches the body to become stronger as well as adapt to stressors. Whether it is circulatory, respiratory, or simple temperature regulation, you will surely discover that your body will become stronger. Do you feel confident that you can handle cold water showering perfectly and lack a preexisting heart condition? Then the best way is to ensure that your maiden experience is having a normal shower and then switch to a one minute of cold water. After becoming used to this, you can then proceed and up the ante by breaking the sessions every thirty seconds from hot to cold, right from that moment you step into the shower.